For those of you who aren’t normally weekend readers, please take a moment to look back at the last post covering Gloria Vanderbilt’s new exhibition. It is a testament to the power of creativity and that age is merely a number not a limitation. 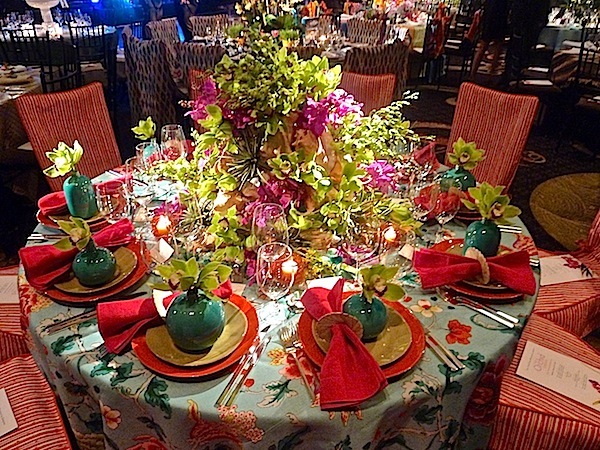 Moving on, today we continue our look at this year’s beautiful tables at the Botanical Garden Orchid Dinner. 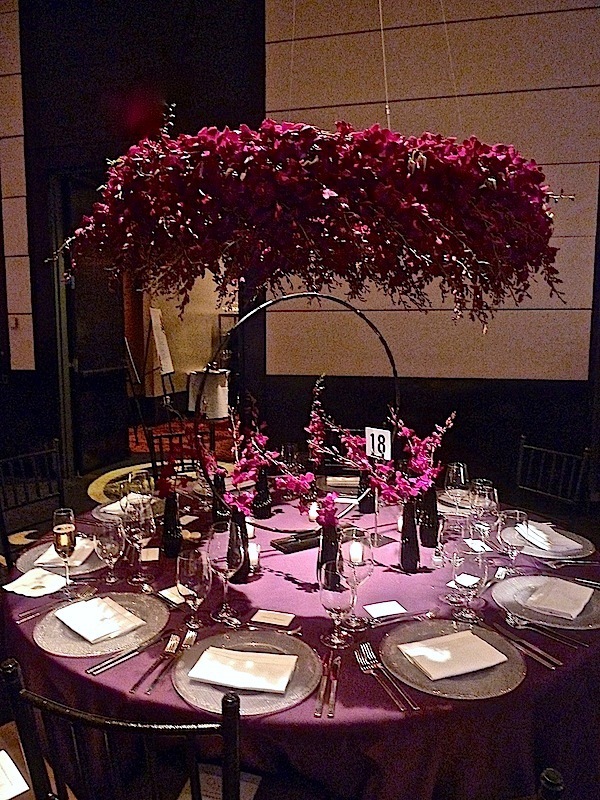 One of the most creative arrangements was orchestrated by Aamir Khandwala for Robert Couturier in which a halo of orchids was suspended over the table. In a clever play on negative space, a hand sculpted metal ring by artist Roque Rey functions as the centerpiece, with the overhanging florals offering an embracing yet spacious surround. The refined purple and black color theme of the orchids, sculpture and Fendi Casa Murano vases made for a beautiful and serene dining environment. A more architectonic setting was executed by designer Shawn Henderson in his ode to Paul Rudolph, the legendary architect and dean of Yale Architecture School in the formative early 60s. A custom structure by TransLUXE, with a suspended rooted orchid, acts as centerpiece, paying homage to Rudolph’s late modernist designs. The modernist theme is continued on the tabletop with elegant selections from Calvin Klein Home, echoing the finesse of form with subtle texture and neutral palette. CK Creative Director Amy Mellen designed the entire collection of hand thrown porcelain Quay dinnerware (with a glazed interior and matte exterior), Fumo crystal and Ellipse flatware, which I admired during my visit to the Madison Avenue store. The embroidered fabric, Nias, is also Calvin Klein for Kravet. 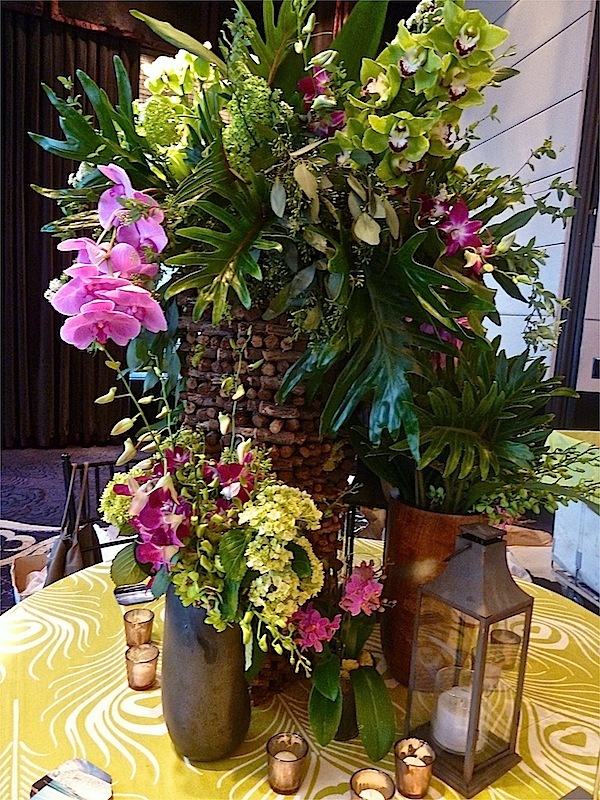 Purity of form was also the theme at designer/architect Carlos Aparicio‘s table where an abundance of loosely arranged orchids cascaded from the structured form of a 1940s Danish vase – a lovely contrast. 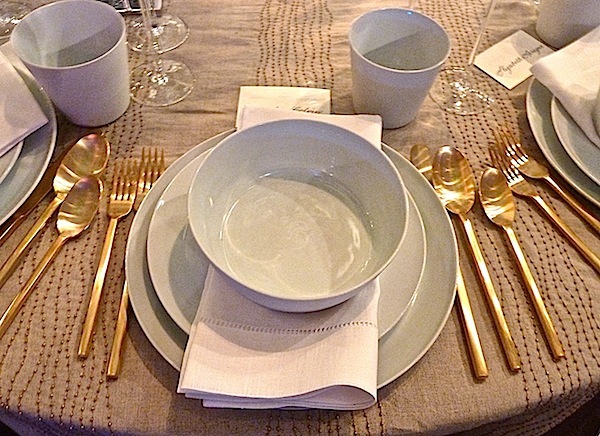 Tropical neutrals were celebrated at David Handy‘s casually chic table. 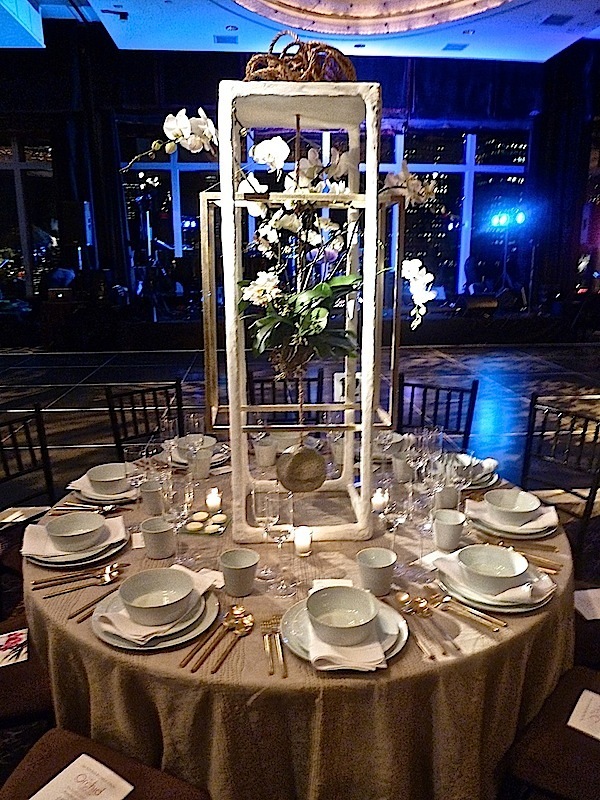 I liked how his centerpiece was thematic but still elegant and restrained. 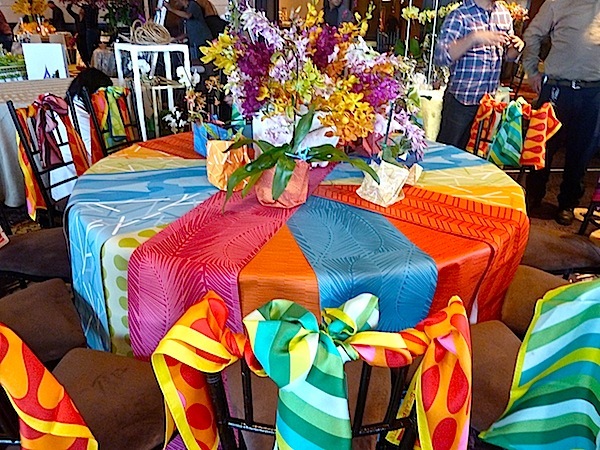 created a festive and colorful table of high low design finds. Bold custom monogrammed napkins sit on classic Mottahedeh Tobacco Leaf dinnerware and lace service plates. And a Home Depot bowl was transformed for the centerpiece with some creative hand painting with the addition of candles found at Target. 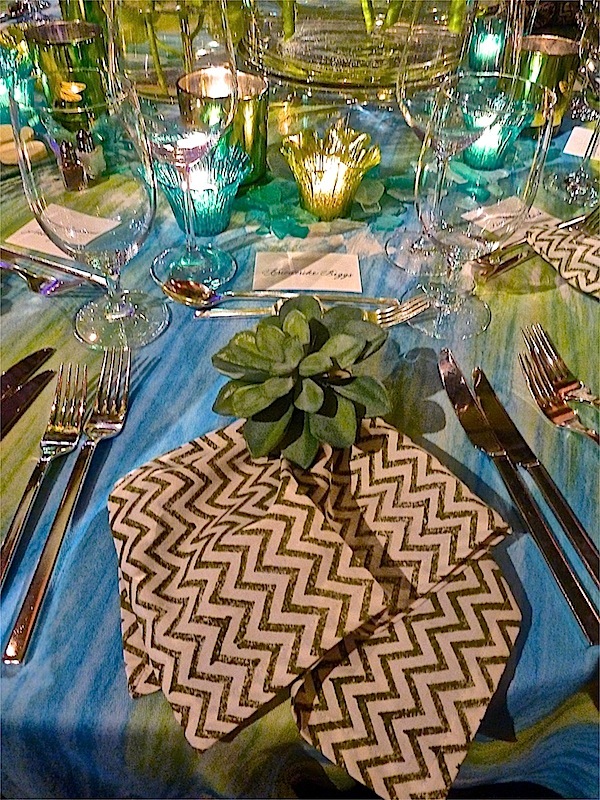 Brunschwig Creative Director Stephen Elrod took Key West’s beachside location as inspiration for his tablescape. The aqua toned tablecloth is New Athos in Berry/Orchid with chair slipcovers of Pique-Nique in Pink/Kumquat. 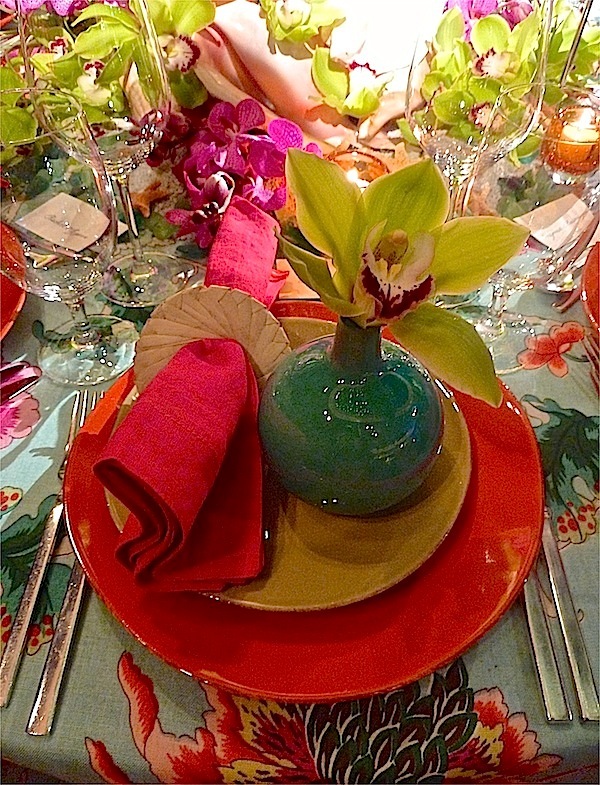 Fun accessories mixed for a tropical take on casual dining. Designing for Arquitectonica, Alison Spear embraced the Miami-headquartered international firm’s love of color. The table in progress shows new product coming from the firm used as a tablecloth. 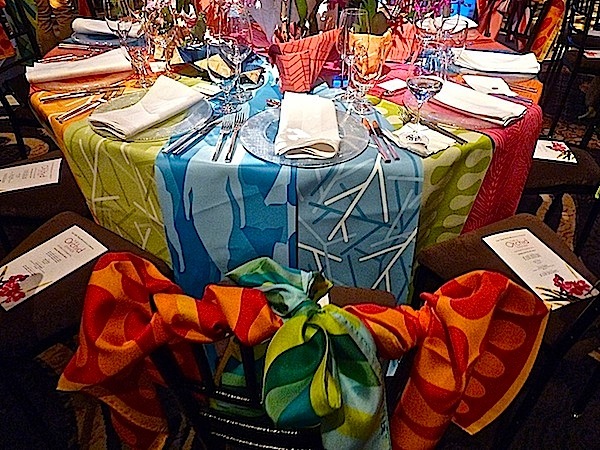 Colorful scarves adorned the backs of each chair. 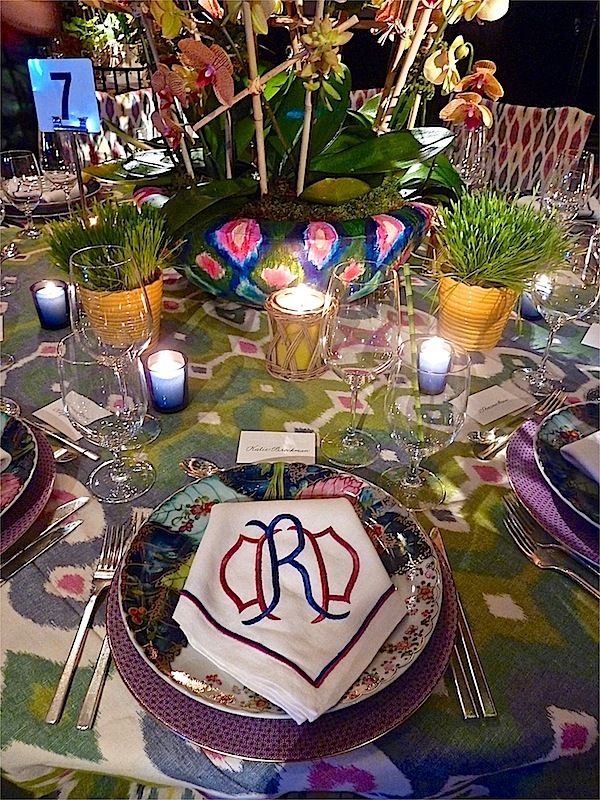 The fresh blue and green colorway at Sherrill Canet’s table was like a welcome slice of summer. 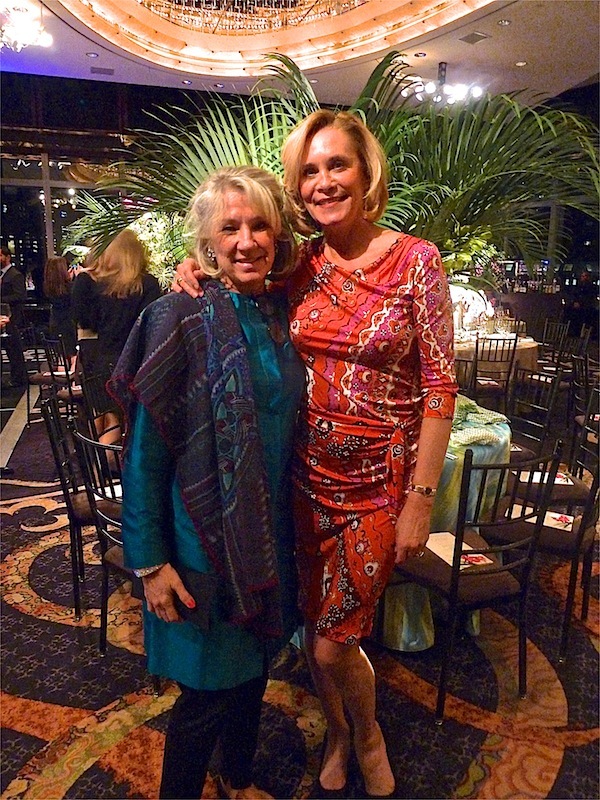 The designer, below with Veranda Director of Decoration and Special Projects and gala Decorations Chair Carolyn Englefield. 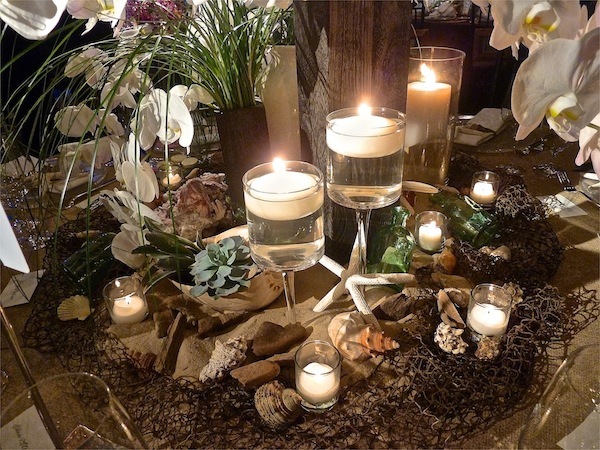 Floral details in the napkin rings and charming votives continued the evening’s theme. 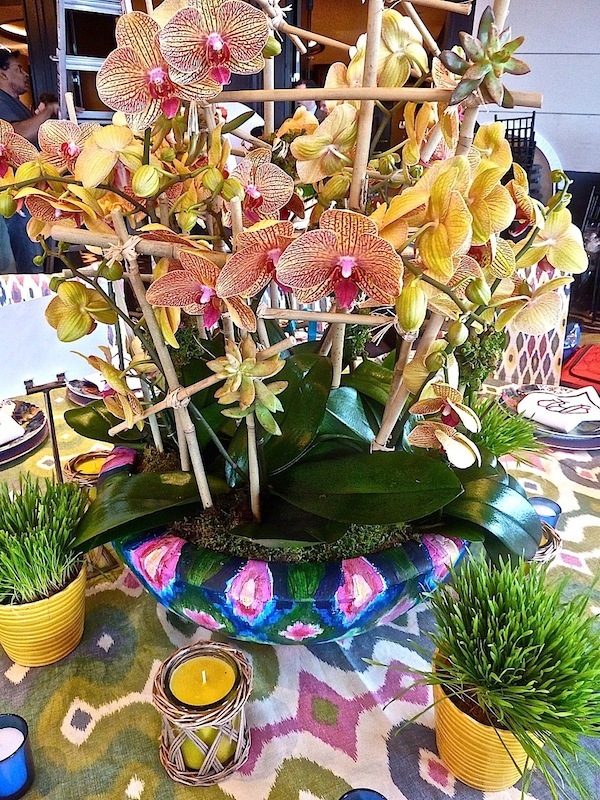 During the day you could see the fabulous container Loni Ludlow used for her striking arrangement at designer Laura Bohn’s table. 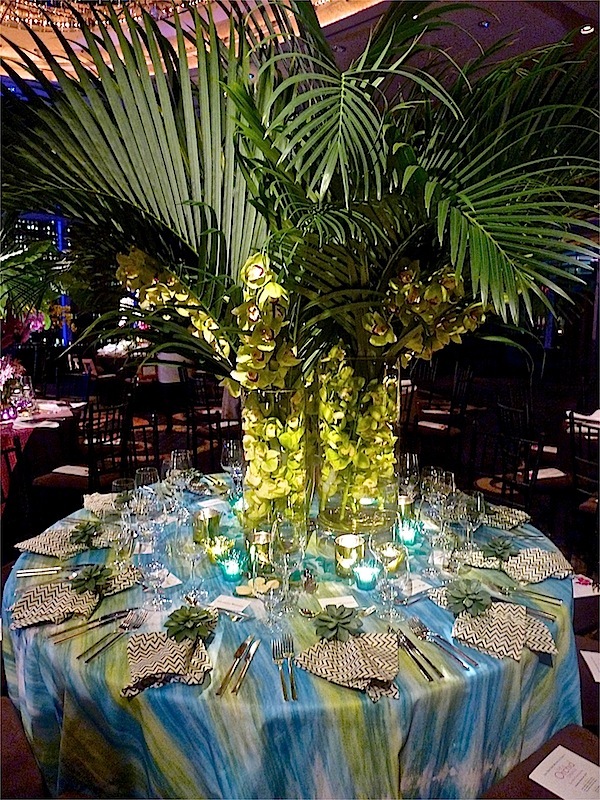 The organic feel is echoed in the pattern of the Duralee’s Plume tablecloth and vases and hurricanes from Seasons Flowers. At dinner the table exuded a sophisticated yet natural Key West inspired vibe. 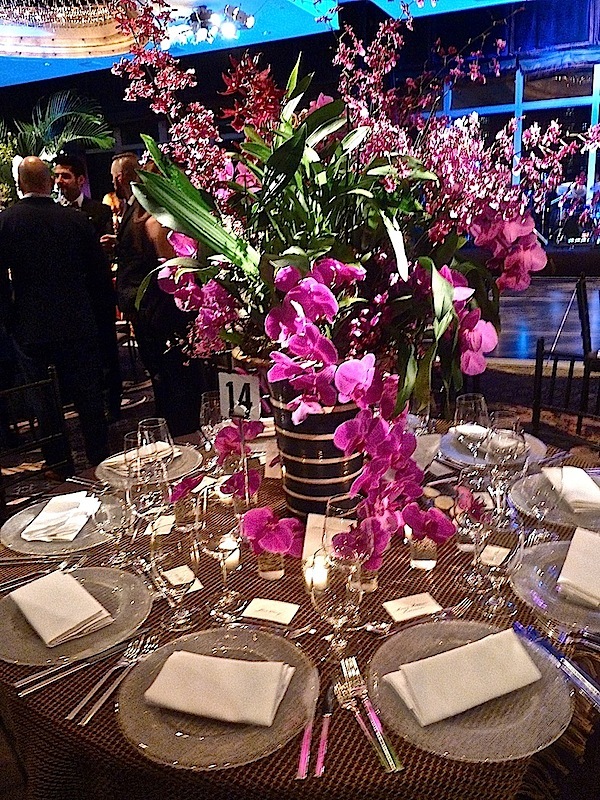 Stop back next time for our final look at the tables from the orchid dinner. Tuesday I will be speaking with Susanna Salk at the Design Bloggers Conference in Atlanta about our video series, so if you are on twitter feel free to follow along. And then later this week will be the debut of our very exciting new video series. This entry posted in garden, interior design. 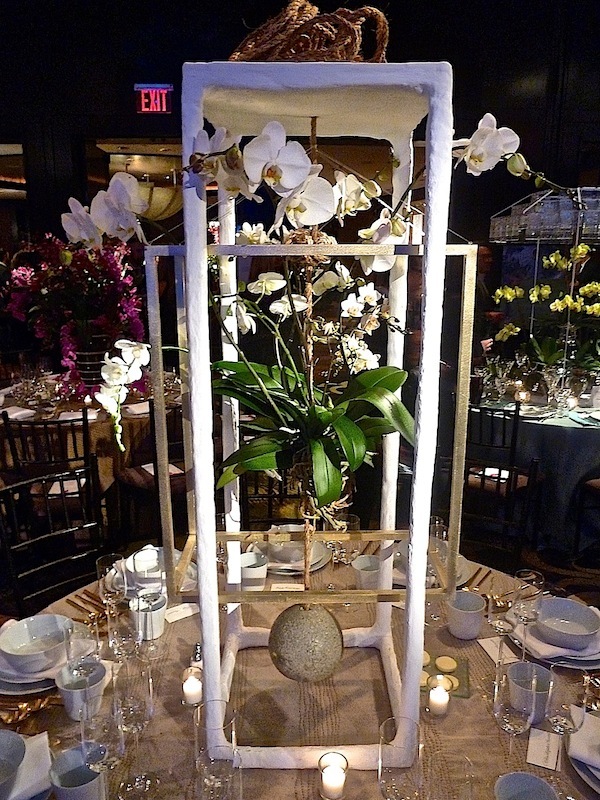 Entry Tags: Flowers, interior design, NYBG Orchid Dinner, Tabletop Design Bookmark the permalink. 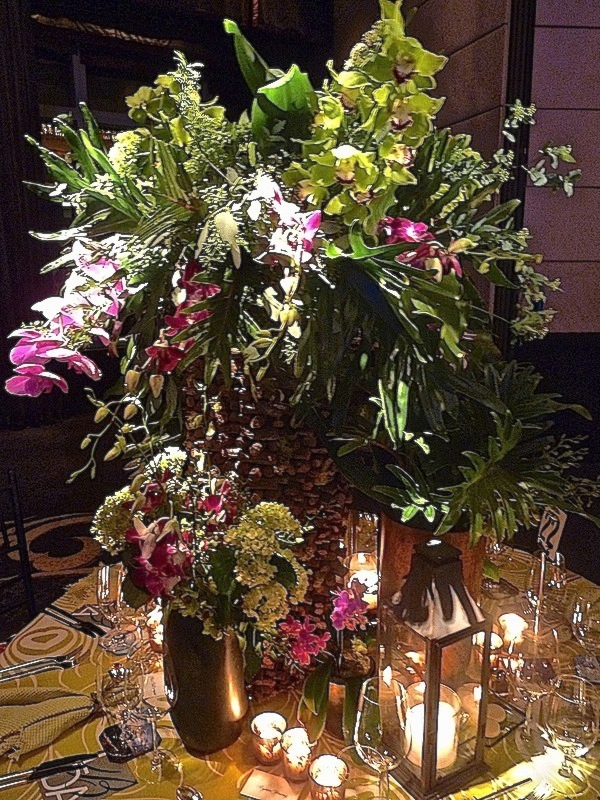 The Oscars have nothing on this glamorous floral finery… Beautiful tables, yet again! We’ll try to follow your panel tomorrow and know you’ll be brilliant. Have fun and the Blogger’s Conference. 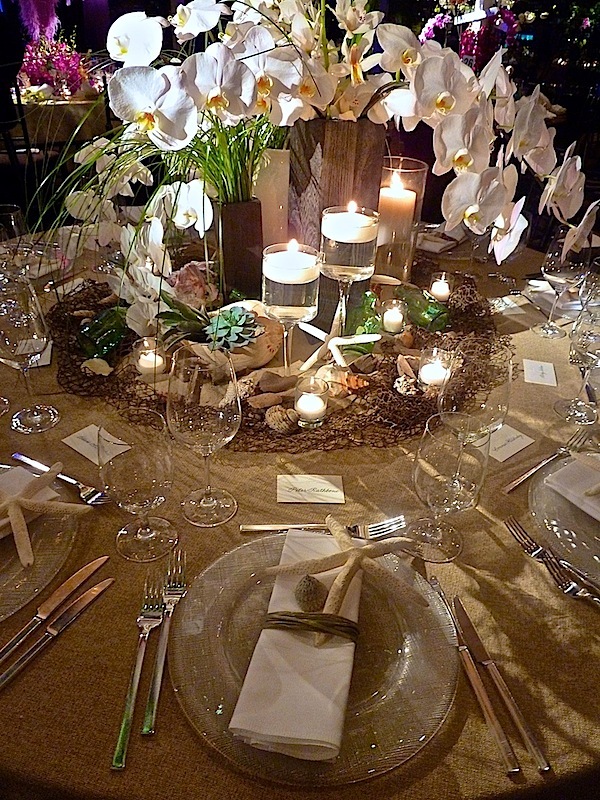 Very nice dinner arrangements.its looking very beautyful. Oh so pretty! And I spy a monogram too. 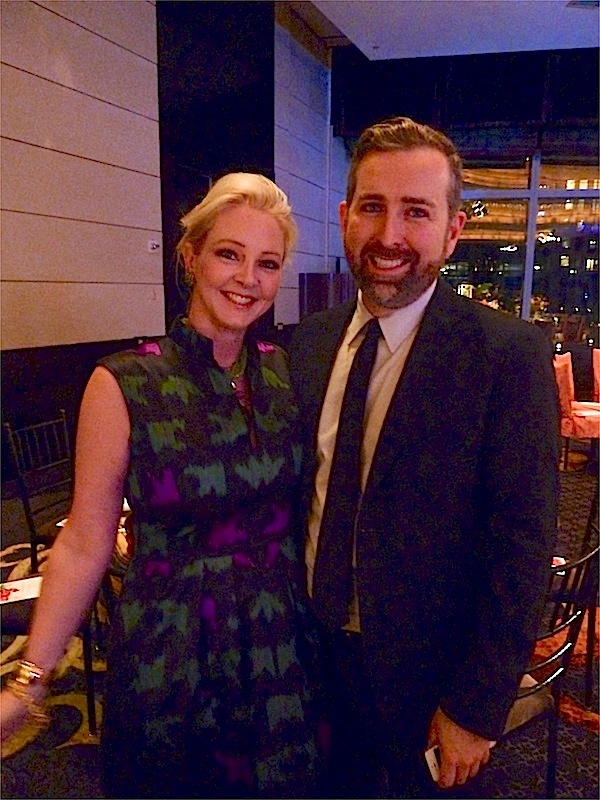 Love your pics of this event Q! 78 queries in 0.696 seconds.